Having a bootable version of the Windows 10 installer on a USB flash drive (aka USB key) can be very useful if you want to install a completely new clean version of Windows 10 on an existing device (e.g. laptop), or if you want to install a dual-boot configuration on an existing device version of alongside Windows 7 or 8.1 instead of upgrading immediately. Having a bootable version of Windows 10 on DVD is possible and equally as good, however many laptops now do not ship with a DVD drive, and USB drives are portable, plentiful, cheap, easier to work with. The first step is to obtain the Windows 10 installation media. The most popular download format is an ISO file which contains all of the Windows 10 installation files in one large uncompressed image. The size of the file will depend on the version of Windows 10, but for reference, the ISO file for the Professional version is about 4 GB. While any USB key will do, there are two important points to consider. 1. Make sure it is large enough to hold all of the Windows 10 installation files. The ISO image is uncompressed, so even though the individual folder and files will be extracted from the ISO image, the cumulative size will be the same as the ISO image. Whatever size the ISO file you have obtained in the previous step is, this is the size of the USB flash drive you need. It should be a minimum of 4GB and 8GB should accommodate most versions of Windows 10. 2. A second point to remember is that the USB will need to be formatted during the process of making it bootable. This means that all existing data will be erased. Ensure you backup any existing data that you want to keep before making the Windows 10 bootable USB flash drive. Using the Windows USB/DVD Download Tool is by far simpler and easier. I include the alternate full step-by-step method because this tool is an older unsupported open source tool, and it is unclear how much it has been tested in different scenarios with Windows 10. I have successfully used this tool with the Windows 10 Preview media, however I know other users that have had problems with this tool with specific USB keys and Windows 8.1. I recommend you try this tool first, and if it does not work, use the step-by-step process documented in the next section. Download the tool from here: http://wudt.codeplex.com/ on an existing Windows 7 or 8.1 machine. If this work, you are essentially finished and can jump to the “All Finished” section at the end of this article. 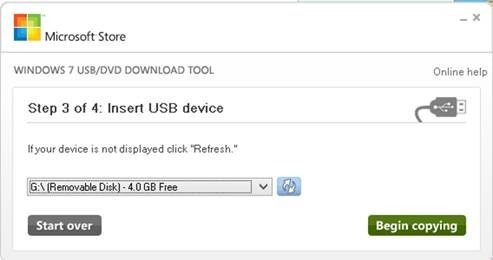 If the Windows USB/DVD Download Tool is not an option for you, this section describes a step-by-step process to create a bootable USB key from an ISO image. Word of warning: some steps require use of the command line and several native administration tools. The high level process described here amounts to: formatting the USB flash drive and creating a new disk partition, marking the newly created disk part as bootable, and copying the individual files in the ISO file to the USB flash drive. As previously mentioned the Windows 10 ISO file contains the individual files which comprise Windows 10. We will need to get access to those individual files to copy them to the USB drive. ‘Mounting’ is the term used to describe treating the ISO image like it was a disk drive with media in it. It will allow us to browse the individual files in the ISO image as if it was on a DVD inserted into a DVD drive. If you are running Windows 8/8.1 computer you are in luck – it natively has the ability to mount the ISO image and see the individual files under a new drive letter. Simply right-click on the ISO file and select "Mount". A new Windows Explorer window will open with the files visible in a new drive letter. If you are using Windows 7 or earlier), you will need to download and install a separate piece of software to mount the ISO file. There are many free software utilities to do this; I have successfully used MagicISO and 7-Zip successfully before. In this step we will create and format a new primary partition on the USB flash drive and make it bootable (so that you can boot your device directly off of this USB key). 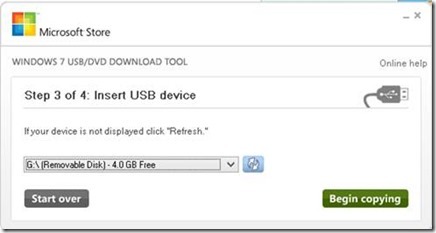 Plug in the USB flash drive if you have not done so already. This can easily be done in Windows 8.1 with the Windows Key + X and select "Command Prompt (Admin)"
This will take several minutes to finish (approximately 15 min depending on the size and type of USB drive). 10. Assign a new drive letter to the USB flash drive: assign (in Windows 8/8.1, after typing assign, a new Windows Explorer windows will open for that new drive – leave this window open – you will use it in the next step). In order to boot a device (e.g. laptop) directly from any disk drive, it must be marked as bootable. This is basically a special signature in the first few blocks of a disk drive, the signals to the hardware that it is capable of booting an operating system. We will use a command line tool called bootsect.exe included in the Windows 10 installation media to mark the new disk partition we created in the previous step as bootable. 1. If you still have the command prompt windows open for the previous step, you can use this. If not, start a new Command Prompt as Administrator. 3. Now change into the boot folder directory: cd boot. You can do a directory listing in this folder (dir) and confirm there is a file called bootsect.exe. If this was successful, you should see a message "Bootcode was successfully updated on all targeted volumes". Start a Windows Explorer on the root of the USB flash drive. Now S=select all the files from the Windows Explorer window of the mounted Windows 10 ISO image (CTRL+A), and copy the files (CTRL+C) to the Windows Explorer window of the USB flash drive (CTRL+P). Your USB flash key is now capable of booting into the Windows 10 installer. You can boot from the USB flash drive and install a clean version of Windows 10 on any computer, or do install a dual-boot with another operating system. Tip – when you power-on a computer the order of devices (e.g. hard drives, USB drives) that the computer checks to see if they are bootable is controlled by settings in the BIOS. Almost all computers have the ability to present a bootable device menu during its power-on sequence. You will likely want use this bootable device menu to select the new Windows 10 USB flash drive that you just created. This menu is invoked by pressing a Function Key when the computer is first turned on. The exact function key depends on the computer manufacturer and BIOS, but a safe bet is to try F12. Many ASUS and Dell laptops use this. A good listing of boot menu function keys are available on the internet such as this one: https://craftedflash.com/info/how-boot-computer-from-usb-flash-drive.